Louisiana Seafood Gumbo is a hearty, savory stew perfect for large groups or just a few friends! 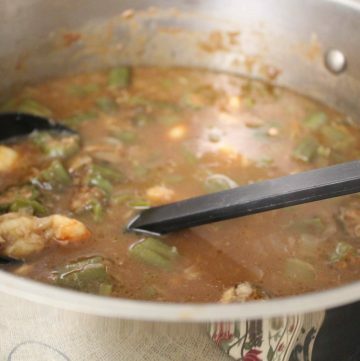 This Seafood Gumbo recipe comes from my Granddaddy’s side of the family, the French side of my heritage. When he and my Grandmother married, he gave her his Mother’s recipe and it’s been in our family ever since. 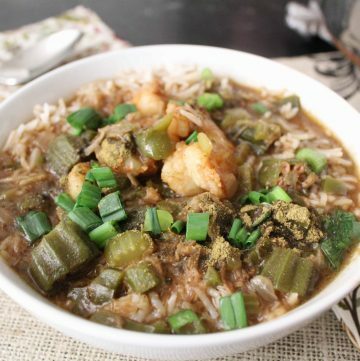 Gumbo is in a category of its own due to the dark roux. The traditional method of making a dark roux takes some time…about 40 minutes. You must cook the fat and flour on a low setting on the stove top, stirring continually until it reaches the deepest, darkest brown. In this recipe, I use an equally good alternative for the homemade roux, which results in less time standing at the stove stirring. Roux, pronounced “roo”, is a French term and refers to the combination of equal parts of fat and flour that are cooked to form a thickening agent. It is the base of most sauces and gravies. The fat can be butter, oil, pan or bacon drippings and the flour is basic white flour. Is Roux Hard to Make? No, but it does require patience. If you cook the roux on a stove that is too hot, you’ll burn the flour and have to start over. (I’ve thrown out many a burnt roux because of my impatient Aries nature…) There are many levels of roux from a white, or blonde roux to a dark roux. The difference between the light and dark roux is time…a light roux cooks in about 5 minutes, whereas a dark roux takes much longer. Does a Prepared Roux Alter the Taste of the Seafood Gumbo? Not if you use the right prepared roux. I’ve experimented with a variety of dry and jarred roux mixes and I can recommend, hands down, either Kary’s or Bootsie’s prepared roux. Both companies are out of Louisiana and they know roux. I’ve used a dried roux mix before and while it was “okay”, it didn’t seem to have the depth of flavor the prepared ones offer. Doesn’t Gumbo Have Tomatoes In It? No. That’s just not right. It’s like putting parsley in cream gravy…no. Just no. Can I Use Frozen Okra? Frozen or fresh, either way. I use frozen because I usually make Gumbo in the winter when okra isn’t in season, so I use frozen. Just thaw it out before adding it to the stew . I Hate Okra. Can I Leave It Out? Well…..you can… but it won’t be a true Gumbo. The okra is included in the dish as a thickening agent. Good Gumbo is supposed to be thick and savory, not thin. If you hate okra, just pick it out of your bowl, but you probably should add it to the recipe for texture, not to mention flavor. How Much File Do I Add and When? First, you NEVER add ground gumbo file, pronounced, “fee-lay”, directly to the Gumbo while it’s on the stove. Second, ground Gumbo file is dried sassafrass leaves which offer a truly unique flavor to the gumbo and serves as an additional thickener, as well as flavorant. Gumbo file is sprinkled on the finished, plated bowl of gumbo…not in the gumbo. Can I Make Seafood Gumbo In Advance? You can make this in advance, just don’t add the seafood until you’re ready to reheat and serve. 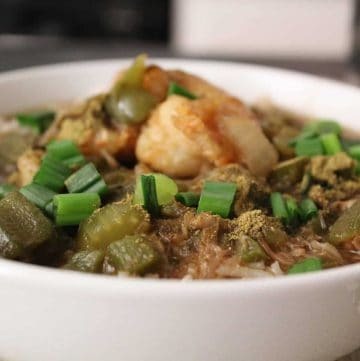 Traditional Louisiana gumbo done right! 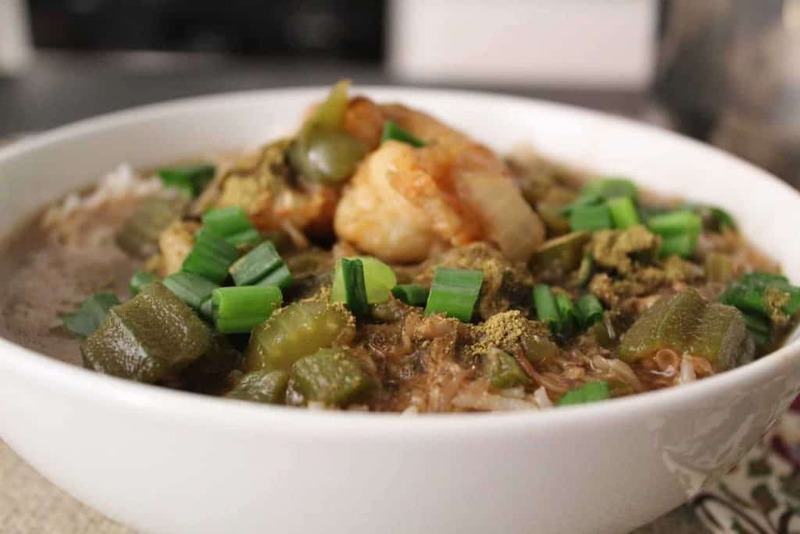 Shrimp, crab meat and okra in a savory blend of spices, served over rice. Dark brown roux is the base of the gumbo. You can make your own or buy a jar pre-made. I use either Kary's or Bootsie's Roux--both from Louisiana. This cuts down on the preparation time immensely. However, if you choose to make your own roux, you'll need equal parts of oil and flour. Start with 1/2 cup each and increase if needed. Homemade dark roux takes about 40 minutes to make, so if time isn't on your side, get the jarred version. 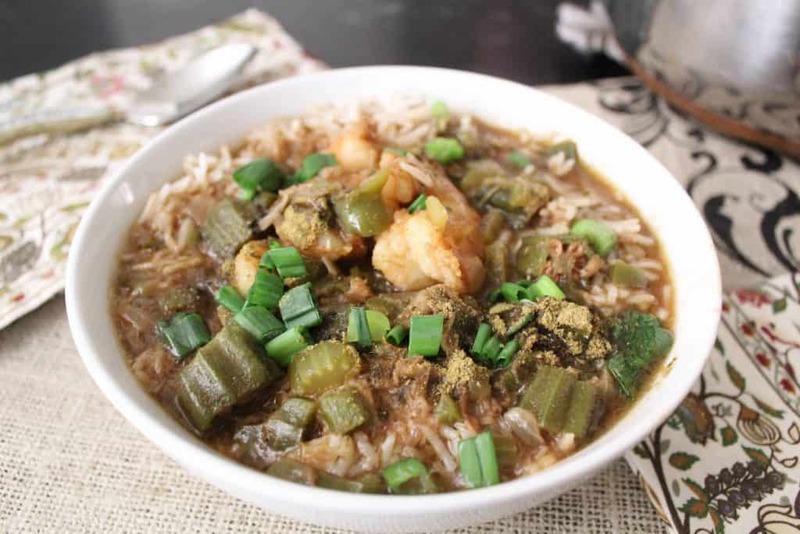 If you like Seafood Gumbo, you might want to try making Shrimp and Crab Beggar’s Purse!